There are dozens of portable storage options in Raleigh, NC. Yet with it’s steel or aluminum weatherproof design and solid DuraPlate truck body construction, none are quite as safe or efficient as AA Self Storage’s portable storage bins. Our state-of-the-art portable storage units come in a variety of sizes and are constructed to bear loads of as much as 6,000 lbs! They also come equipped with translucent roofing for easier loading and secure door locking systems for maximum theft protection. Tired of calling a business over and over again only to be transferred to an automated answering machine? 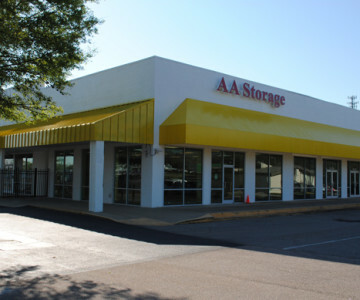 AA Self Storage personalizes the portable storage process, putting you directly in touch with an on-site manager of our Raleigh Facility to ensure your needs are met. Contact our Raleigh location today! For more information about our self storage or portable storage solutions, please visit our Raleigh Facility located off Tryon Road or click here to make a reservation online. Moving coordinators are available to assist you at 1-866-369-9726. Call now!